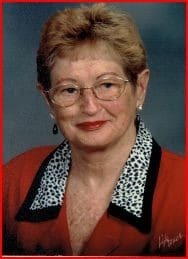 Edith Marie Polito, 91, of Palm Harbor passed away Tuesday April 9, 2019 in Largo, Florida after a lengthy battle with Alzheimer’s disease. Edith’s family was by her side. She was born to the late James C. and Ethel M. Mast on November 25, 1927 in Benzonia, Michigan. Edith graduated from Benzonia Consolidated High School in 1946 before attending a training school in Kansas City, Missouri where she prepared for an airline career. Upon graduation, she received an offer to work for Capital Airlines in Washington, D.C. While in Kansas City, she met Samuel Polito of Wilkinsburg, PA. He followed her to Washington, D.C. where they wed in November 1947. They were married for 41 years until his death on June 11, 1989. Edith was preceded in death by her brother William Mast in 1984, sisters Mildred (Mast) Harwood in 1989, Thelma (Mast) Dragoo in 2001 and Doris (Mast) McCurdy in 2018. Edith is survived by her three children: Gina Hoover, 56, of Alexandria, VA; Anthony Polito, 55, of Palm Harbor, FL and Timothy Polito, 52, of Elgin, SC; four grandchildren: Macie Pethtal, 31, of Woodbridge, VA, Lauren Polito, 26, of Palm Harbor, FL, Dan Polito, 24, of Palm Harbor, FL and Chelsea Hoover, 17, of Alexandria, VA and one great granddaughter: Leola Turner, 3, of Woodbridge, VA.
Edith was an active member of Palm Harbor United Methodist Church and the Retired United Airlines Employees Association. Edith swam daily at Highland Lakes Community Pool until health issues and Alzheimer’s disease became too much for her. She received an award for swimming 80+ miles over the years at Highland Lakes. She had an immense love of travel and visited Asia, Australia, Europe and South America. Edith will be buried on Monday April 15, 2019 at 11:00 AM at Curlew Hills Cemetery, where she will lie with Samuel. In lieu of sending flowers, the family asks that donations be made in support of Alzheimer’s research.